I have a bunch of friends who travel the world in search of good waves and tell me there’s plenty of good surfing spots in Sardinia. Simone has moved to Lanzarote because he wants to have good weather year round and warm waters to catch waves. Alessandro plans a surf-stop wherever he goes. 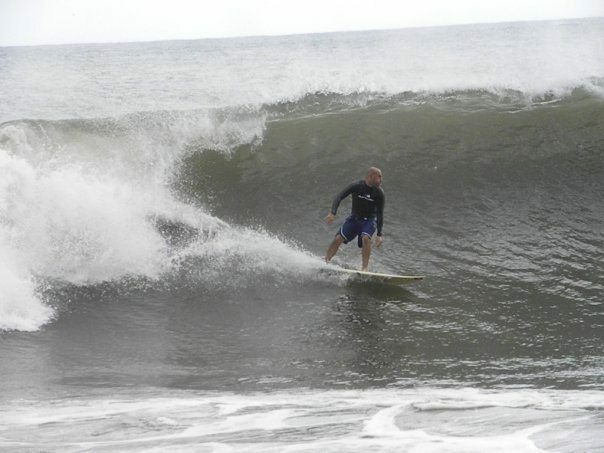 When he planned his trip to Central America, he was enthusiastic to find that there is great surfing in El Salvador, Nicaragua and Costa Rica. 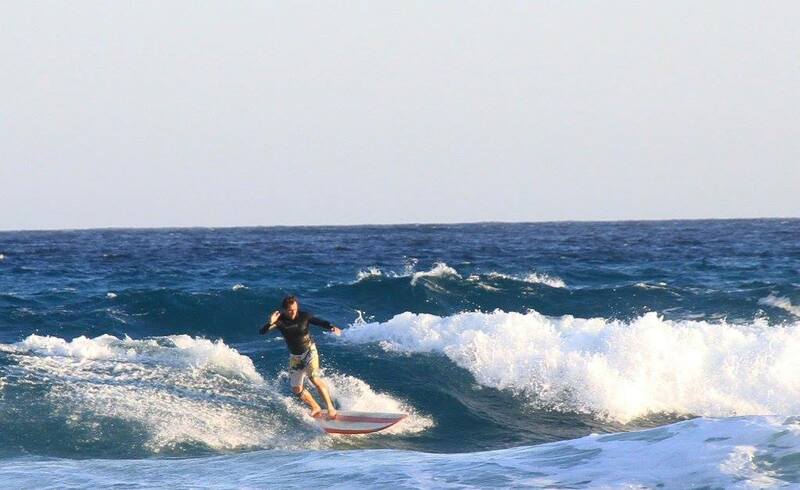 However, our very own Sardinia has some incredible surfing spots. Acclaimed for its amazing beaches, its nature, its beautiful small cities, the unique archeological sites, the great hiking trails and the ancient culture, Sardinia offers good surfing year round. Sardinia enjoys a very favorable position in the Mediterranean, such that it always gets small to medium sized waves year round, especially along the west coast. If winter is by far the best season to catch good waves, it is also possible to do so in other seasons, especially when the strong mistral wind sweeps the island. Those who are fortunate enough to travel to Sardinia in the summer may get the best of both: incredible beaches to relax on sunny days, and great surfing spots on windy ones. Following is a selection of the best 11 surfing spots in Sardinia, as recommended by my friends who love surfing. Don’t be fooled by the picture: while Chia is a fantastic beach to hang out on quiet days, it also is an incredible surfing spot. Located on the south coast of Sardinia, Su Giudeu, Chia is a favorite of locals for many reasons. There is a lagoon right behind the beach, where pink flamingoes live; the sand is fine and golden and has formed gorgeous sand dunes; there is a small island that can he reached easily from the shore and, as if this is not enough, when the winds blow from the north east or the north, Su Giudeu, in Chia is ideal for surfing. San Nicolao and Portixeddu are located on the south west coast of Sardinia. They are two beautiful white sand beaches that are not far from the former mining village of Buggerru. They get excellent waves, up to 3 meters high, when the mistral winds blow. It’s been the location of competition run by The European Professional Surfing Association. Not far from Portoscuso and on the south west coast of Sardinia, Guroneddu is an excellent surfing spot in the winter months, while summers tend to be mostly flat. The best time to go is when the wind blows from the west. It is an exposed reef, and there’s also rocks and urchins to watch for. Guroneddu isn’t easy to reach, but worth the search. On the west coast of Sardinia and not far from Oristano, one of the main cities on the island, there’s the Sinis peninsula. At the north of the Peninsula there’s a beautiful strip of white sand called Putzu Idu, which is ideal for any water sport, such a windsurf, kitesurf and even surf. Capu Mannu is close to Putzu Idu, to the north, and get some of the biggest waves in the Mediterranean. They get the best surfing conditions with either mistral or south west winds. Porto Ferro is a beautiful unspoiled beach close to Alghero, one of the most beautiful cities in Sardinia. It is a stretch of sand of around 2 km of sand, with clear azure waters, where surf junkies love going right after storms from either south west, west or north west. It’s a good surfing spot even with active south west wind. Isola Rossa and La Marinedda are located on the north coast of Sardinia, not far from the lovely village of Castelsardo and in what is known as Costa Paradiso. Isola Rossa takes its name from the small island located just 400 meters from the shore. Its main feature is a large coastal Spanish watch tower built in medieval times in order to protect the area from the invasions of pirates. The nearby La Marinedda, is a small cove where some easy hiking trail afford splendid views of the clear waters. Both beaches are perfect for surfing whenever the mistral wind blows. On the south east coast of Sardinia and at about one hour drive from the main city, Cagliari, Porto Giunco, not far from Villasimius, is one of the most amazing beaches on the island. It is a beautiful bay with incredibly fine, soft, white sand and the most amazing blue waters; right behind it the salt pods of Notteri are inhabited by pink flamingoes. With south east and east swells, Porto Giunco becomes a fantastic surfing location. Located on the south coast of Sardinia at about 25 minutes drive from Cagliari, Racca Point is a lovely beach with clear waters and one of the best places to surf in the island. The best time to catch waves is when the wind blows from north east. That’s when there are long waves to ride. Have you ever surfed in Sardinia? What were your favorite surf spots on the island? Great, informative post! I’m visiting Sardegna from 7-14 november and I was thinking of picking up surfing again. It’s been six years though, so I figure I should take one lesson to refresh my skills. Do you have any suggestions for where I could take a quick surfing class? Can you recommend somewhere near to area who could accommodate us for a few days and hire us some boards etc? Hi Claudia, I plan to vacation and surf on the west coast of Sardina September 24 – 29, 2019. I am trying to find a fun place to surf with nice beaches on the west coast where I could also rent surfboards. I am also looking for a hotel on the beach or near the beach or maybe you have other ideas about where to stay? Can you put me in touch with some surfers on the west coast that can help me plan my trip?